I made this into an Red Palm Ormus Oil by taking Red Palm Oil and adding Dead Sea Salt, Red Hawaiian Alaea Salt, and Pink Himalayan Salt. I let it sit for 3 days in a M.E.O.W. Device, shaking it up every now and then and finally filtered out the salt. Red Palm Oil was so revered by Egyptians, that it was often times included in the tombs of Pharaohs so that these kings and queens would have access to it in the after world. In many African towns (where it’s derived), red palm oil is their number one medicinal cure. From head aches to joint pain, they have reached for this firey oil for centuries. If it’s been such an important part of civilizations for hundreds, even thousands of years (studies show it’s been used for nearly 5000 years). Red palm oil, is a both a saturated and an unsaturated fat (close to 50:50) and is derived from the fruit of the oil palm tree. If you’re into that kind of stuff, the real name is: Elaeis guineensis. 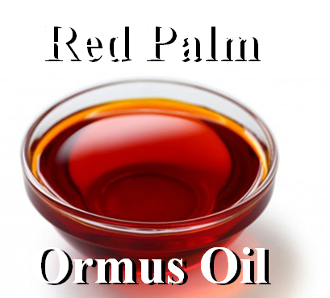 The name “red palm oil” comes from it’s rich red-orange color in it’s unprocessed state. Just like with all plants, the color is representative of it’s antioxidant profile: Tomatoes and watermelon are red because they contain the antioxidant lycopene. Eggplant and blueberries are loaded with resveratrol and red palm oil? Red palm oil contains MORE of both of these than the infamous carrots and tomatoes. Alaea salt, sometimes referred to as Hawaiian salt, is an unrefined sea salt that has been mixed with a red alae volcanic clay. It get its pink and brownish color from the particles of volcanic red clay. It is part of Native Hawaiian cuisine and is used to season dishes such as kalua, poke, and pipikaula (Hawaiian jerky). It was also used to cleanse, purify and bless tools, canoes, homes and temples. It was exported for use by salmon fishermen in the Pacific Northwest. It is also used in Native Hawaiian cuisine and fusion style cuisine of Hawaii and is exported. Alaea salt was used by Hawaiians to cleanse, purify and bless tools, canoes, homes and temples.Alaea salt is also used in several traditional Hawaiian dishes such as Kalua Pig, Hawaiian Jerky and Poke.In the 19th century Hawaiians began producing large amounts of salt using European salt making techniques and became a leading salt supplier for salmon fishermen in the American Northwest. Healing clays and medicinal minerals have been used by people worldwide to detoxify, heal and promote health. Native Americans called these medicinal minerals “Ee-Wah-Kee,” or “the mud that heals.” Ancient Egyptians called it “Pteen” and the Hawaiians called it “Alaea.” Hawaiians used the sacred red clay as a dye in purification ceremonies (hi’uwai) and as a way to heal broken bones and remove poisons through the skin. It was even eaten as a nutrient supplement. Today, Pelotherapy (or healing using earth, clays and muds) is an accepted practice at spas and wellness centers to promote physical health, enhance healing, remove toxins and to produce glowing external beauty. Hawaiian Clay is widely known for its healing power. You will find it highly effective in soothing and healing burns, stings, bites and bruises. It easily recharges and rejuvenates the skin while fighting acne, eczema, wrinkles, stretch marks and sun damage. Hawaiian Clay is formed from an ancient volcanic ash deposit that is high in phosphorous, iron, calcium, magnesium and other trace minerals. It is found deep in the rainforest of Maui, Hawaii, where it has been purified for thousands of years by sacred springs and the gentle rains of the islands. It is guaranteed to be some of the purest and softest clay on the planet. Living Clay is hand harvested by community-minded individuals. It is then sun-dried in Maui near equatorial light and then stone ground and sifted by hand. We present it without blessings and hope you enjoy using it. The Himalayan salt beds formed in the Jurassic era when large seas dried out. The massive salt flats where covered up through the ages, they became locked deep in the earth. Local weather, erosion and water leached minerals into the berried salt, imparting minerals color and taste. This gourmet salt is pure, hand-mined deep inside the pristine Himalayan mountains. The high mineral content of the Himalayan salt crystals range in color from sheer white to varying shades of pink to deep reds. The darker the color the more minerals are in the salt.